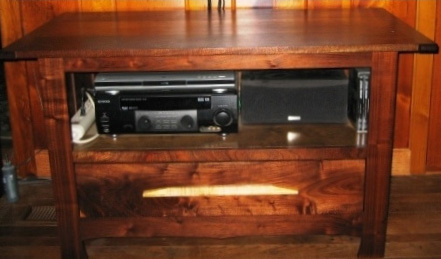 With the growing popularity of flat panel televisions, the traditional entertainment centers used for older tube style sets no longer fit the large flat panels. Additionally, hanging the display on the wall leaves a difficult question: what to do with the electronics and media storage? 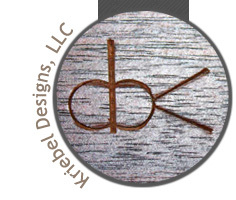 Along the lines of the older television tables, Kriebel Designs offers custom solutions for plasma, LCD, and DLP televisions. The straight lines of this table offer a warming to the room without being overpowering. 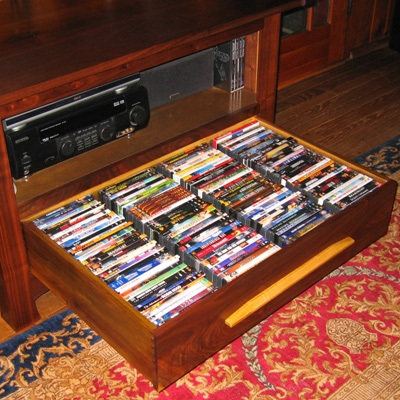 The large drawer accommodates over 130 DVDs, with ease and glides on hidden undermount drawer slides. 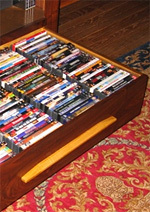 The large drawer provides storage for DVDs.